Make these sweet potato breakfast meal prep bowls ahead of time and you’ll be rewarded with four delicious, veggie-packed breakfasts waiting for you in the fridge. It’s funny because I am starting to lose track of how far along in my pregnancy I am. First pregnancy, you always know how many weeks, how many months, what size ‘fruit’ your baby is (they like to compare baby size to different fruits on pregnancy apps). Second pregnancy? Not so much. Nursery? Not even started. Name? We kind of sort of think we have one. But it’s kind of a weird one which of course makes me second guess it. Kai wants to name the baby after one of the Paw Patrol characters, which is pretty hilarious! I hope this is a sign of how things will be the second time around. More laid back, less googling and more time spent ‘in the moment’. Now that I’m in my third trimester, my appetite has definitely picked up, and I am suuuuper hungry first thing in the morning. 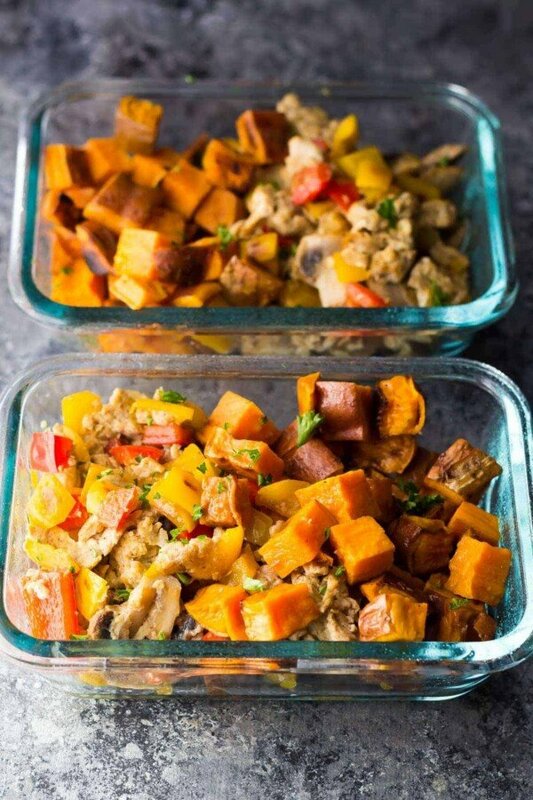 These sweet potato breakfast meal prep bowls have been great to have on hand because they are a delicious and convenient way to get the day started. This recipe is from my breakfast meal plan eBook Rise & Shine. If you want someone to tell you exactly how to make healthy breakfasts for the week (in under 1 hour) and provide a printable shopping list, then you might enjoy this eBook…there are 8 weeks with both sweet and savory breakfasts, fridge and freezer-friendly, all healthy and all delicious! 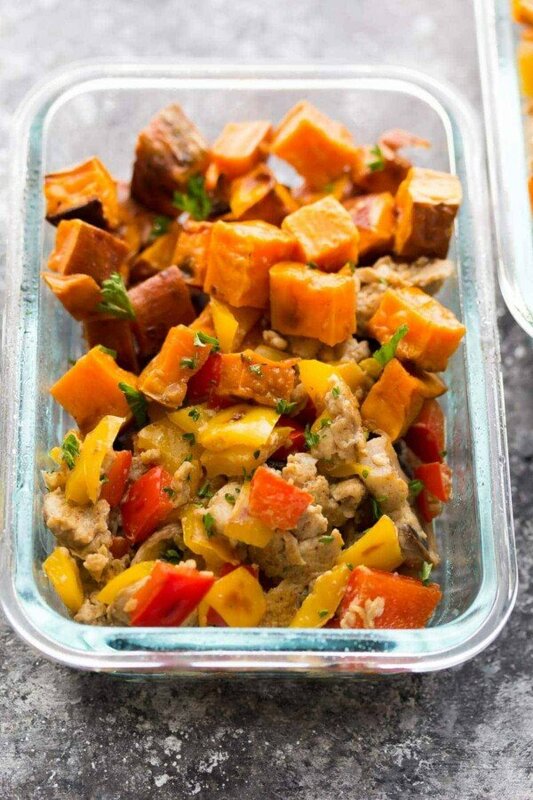 What’s to love about these sweet potato breakfast meal prep bowls? Well, other than being packed full of healthy veggies, it is also packed full of flavor. The sweet potatoes are cooked up in a little olive oil and chili powder, then portioned out into the bowls. You could also roast them in the oven for 25 min at 425°F if it’s cool enough to turn the oven on. Next, cook up some bell peppers and mushrooms…I’ve also used asparagus instead of mushrooms and it was great! Once the veggies are soft, you add in some eggs, scramble until cooked through, and voila! One seriously healthy but satisfying breakfast bowl! Make that four…because these guys can keep in the fridge for four days, making breakfast the easiest meal of the day. 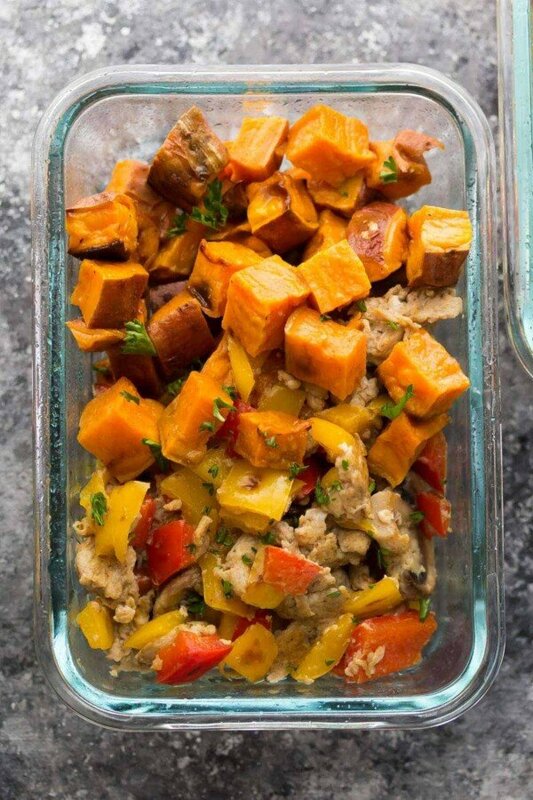 Make these sweet potato breakfast meal prep bowls ahead of time and you'll be rewarded with four delicious, veggie-packed breakfasts waiting for you in the fridge. In a large bowl, toss the olive oil, sweet potatoes, chili powder and salt. Add to a large pan and cook over medium heat for 10 minutes, stirring occasionally. Add ½ cup water to the pan and cover. Cook for 10 more minutes, or until sweet potatoes are softened. Portion out into 4 containers. Add additional olive oil to the pan if necessary. Add the bell peppers and mushrooms, and cook for 5 minutes until softened. While cooking the veggies, beat the eggs with the milk, chili powder and salt. Add to the pan with the veggies and cook for 3 more minutes, or until eggs are cooked through. 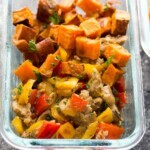 Add to the 4 containers with the sweet potatoes. StorageStore in the fridge for up to 4 days. To ServeHeat in the microwave until steaming hot. Serve with salsa and/or avocado. Hi Hannah! I have not enjoyed the texture of freeze/thawed roasted sweet potatoes…they get kind of mushy. But the scrambled eggs should be freezable for sure! Why is there no protein content listed? 10 g protein, must have gotten deleted when I was entering the info.